BUFFALO - The first clue that the Tuesday afternoon session in Part 4 of Buffalo City Court was not like other criminal proceedings came just before it started. Judge Robert Russell stepped down from his bench and walked into the gallery where men and women accused of stealing, drug offenses, and other nonviolent felonies and misdemeanors fidgeted in plastic chairs. "Good afternoon," he said, smiling, and talked for a minute about the session ahead. With the welcoming tone set, Russell headed back behind the bench, where he will mete out justice with a disarming mix of small talk and life-altering advice. Russell is the head of a courtroom team of veterans' advocates and volunteers determined to make this brush with the criminal justice system these veterans' last. "They look to the right or to the left, they're sitting there with another vet, and it's a more calming, therapeutic environment," Russell said. "Rather than them being of the belief that 'people don't really understand me,' or 'they don't know what it's like' - well, it's a room full of folks who do." If the veterans adhere to a demanding one- to two-year regimen of weekly to monthly court appearances, drug testing, and counseling for any combination of post-traumatic stress disorder, depression, substance abuse, or anger management, they could see their charges dismissed, or at least stay out of jail. After counting 300 veterans in the local courts last year, the judge tailor-made the treatment court to address not only veterans' crimes, but their unique mental health issues. Charles Lewis, who stood before Russell at a recent session, may be the kind of defendant the judge had in mind. The 25-year-old acknowledged walking out in frustration from his last counseling session. "We all know that you're a good person who at times has done some inappropriate things," Russell told him. "It's time to get past the nonsense, don't you think?" Lewis nodded in agreement. A jet mechanic four years into what he thought would be a 20-year Navy career, he severely injured his leg on the flight deck of the carrier USS Theodore Roosevelt in 2004 and was discharged. Forced to rethink his future before his 22d birthday, he returned to Buffalo, where he found work as a laborer and in the concrete business before starting his own concrete company. After taking on more work than he could handle, Lewis said he found himself charged with larceny in December for allegedly keeping a $3,000 deposit from a customer for a job that never got done. A daily habit of prescription pain pills for the plates and pins in his leg compounded the problems of someone who had known only the rigidity of the military from the time he was 18. "It was hard to adjust," Lewis said later at his home in Buffalo's north end. "I was used to that structure. That whole time [in the Navy] I was doing what I was supposed to do, then I got out and it was just not working." 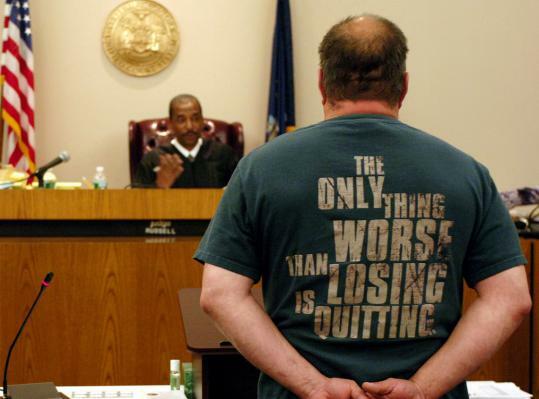 A 30-day stay in rehabilitation to get off prescription drugs began his path through veterans' treatment court. "I'm doing really good now," he said. Russell believes the need for courts like his will only grow, pointing to the 1.6 million troops who have served in Iraq and Afghanistan. It has been highly praised by the Veterans Affairs Administration and other veterans' organizations. The group has been working with Senator John F. Kerry of Massachusetts, a decorated Vietnam War veteran, on legislation that would provide grants for the creation of veterans treatment courts like the one in Buffalo. "A lot of veterans, when they come home, find the transition difficult and we all turn to different things to get through those times," said Campbell, who served in Iraq in 2004-2005. "If we're not lucky enough to have a strong family social network to hold us together in those difficult times, people turn to drugs, turn to alcohol."